A direct action/base camp will be taking place September 6th-10th. The location will probably be somewhere in Humboldt Redwoods State Park. Non-Violence, Solidarity, Backwoods and Climbing trainings will be offered. The camp is free, but donations are needed and appreciated. 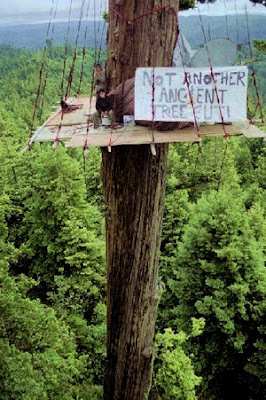 The focus of the camp is to prepare activists to be effective in non-violent forms of direct action, and to support the tree-sits in Fern Gully ( in Freshwater ) and Nanning Creek ( near Scotia ). We are brought together with the common goal of preventing old-growth logging, clear cutting, the use of herbicides and non-sustainable forestry in all areas of the region, the nation and the planet. For more information please call 707-834-3100 or 949-274-0998 or 707-845-9046 or email spooner@spoonerdirect.org.